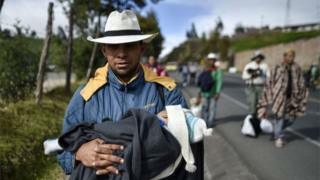 The Venezuelan government says the levels of people leaving the country are "normal". UN figures suggest that 2.3 million people have fled Venezuela's economic and political crisis since 2014. Vice-President Delcy Rodríguez said the figures had been inflated by "enemy countries" trying to justify a military intervention. She spoke as officials from 11 Latin American countries held talks to find a way to deal with the mass influx. At the end of the two-day meeting in Ecuador's capital, Quito, they called on Venezuela to issue valid passports and identity cards for those willing to leave the country. They also urged all countries in the region to continue welcoming and protecting migrants fleeing Venezuela's economic collapse. An 18-point declaration was signed by the 11 countries most affected by the migration crisis, including Colombia, Peru, Ecuador and Brazil. Ms Rodríguez said the government had complained to the UN Secretary-General António Guterres about "individual officials" who she said had been portraying "a normal migratory flow as a humanitarian crisis to justify an intervention". Last month, the UN migration agency warned that Venezuela was heading for the same refugee "crisis moment" seen in the Mediterranean in 2015. Ms Rodríguez said that the United Nations had used data provided by "enemy countries" and presented it "as if it was their own". While she did not name the "enemy countries", she went on to accuse neighbouring Colombia of asking for international funds ostensibly to deal with Venezuelan migrants on its border, when its real plan was to "live off" the donations. Venezuela's government routinely blames neighbouring Colombia for many of its problems, including a failed drone attack on Venezuelan President Nicolás Maduro. 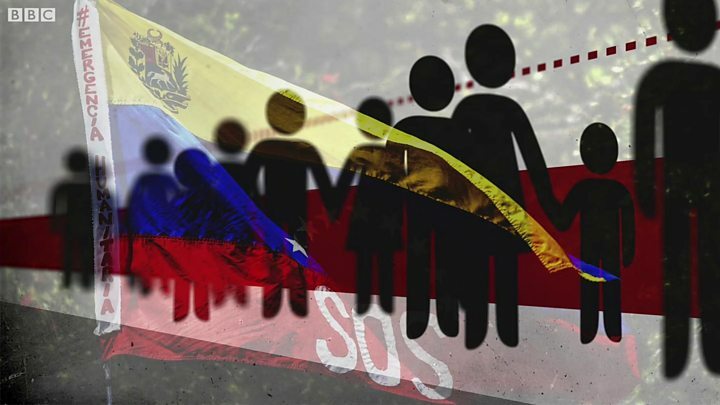 While Ms Rodríguez did not say how many Venezuelans had left the country, President Maduro himself put the number at "no more than 600,000 in the last two years according to confirmed, certified, serious figures". However, he did not give details about the source of that figure. UN figures for 2017 suggest that number is much higher and data for 2018 indicates migration from Venezuela has been speeding up further as the economic crisis deepens and more Venezuelans report going hungry or not having access to key medicines or medical care.